Adm. Stavridis: I am a very good cook, because I grew up around terrific cooks. My grandfather came here from Greece as a refugee in the early part of the 20th century and – like many Greek-Americans, immortalized in My Big Fat Greek Wedding – opened a restaurant, the Downtown Diner in Allentown, Pennsylvania. So cooking is in my blood and I love make big Mediterranean dinners – risotto, cassoulet, tagine, paella, roast lamb, anything from the Mediterranean and the Levant. Adm. Stavridis: I think we become leaders in three ways. First, through what we absorb in our families – I was lucky to grow up with two wonderful, ethical, and intellectually engaged parents. My father was a US Marine Corps Officer, and we lived all over the world. My mother, who is 89 and still reads a couple of novels a week, was a terrific influence on me to be a reader and self-learner. Second, we are a product of our educations – mine was at the US Naval Academy, which instilled discipline and a respect for others; and at Tufts University, where I earned a PhD in international relations. When I went to Tufts in my 20s, I was a capable mariner and Naval Officer and knew how to launch a missile; at The Fletcher School of Law and Diplomacy, I learned how to launch ideas. Third and finally, we become leaders as a result of the experiences we have in life, both good and bad. After 37 years in the Navy, serving around the globe, I had a rich level of experience to apply to everything life could throw my way. Adm. Stavridis: Two come to mind. As a young Commander in the Navy in my mid-30s, I was captain for a destroyer for the first time. The ship was the rock star of the Norfolk waterfront and we won every conceivable award. I thought we were invulnerable. Then we failed a major engineering experience, and I thought I would be fired. To my surprise, my Commodore – my immediate boss – gave me a second chance. And my crew of 350 sailors rallied around me. But the biggest lesson was the way my peers – the other ship captains on the waterfront – all pitched in to help our ship through the challenges. We often overlook the importance of peers to our development as leaders and the trajectory of our careers. So that was a failure from which I learned a great deal. Another was my experience commanding 150,000 troops in Afghanistan. We were in a very difficult phase in the campaign, and the classic “hard power” approach was not producing the results we needed to fight an insurgency. We developed a better approach using some classic “soft power” tools to combat the insurgency – literacy training, medical diplomacy, economic development, humanitarian construction of schools, wells, and clinics. While Afghanistan remains very challenging, we have today fewer than 14,000 US troops there, down by 90%, and it is the Afghan Security Forces who are defending their country. My four years in command at NATO taught me that you need innovation to succeed, and that the classic tools of combat will not always prevail. Adm. Stavridis: Three come immediately to mind. The first is empathy, the ability to put yourself in the shoes of the others. This is crucial for any leader, because it opens up a far wider degree of options to interact. Second is humility; all of us will fail, often again and again. I certainly did along the long voyage of my career and having the humility to recognize that is a normal part of the path is key. Third is innovation, and an attendant curiosity about the world. Steven Jobs said the difference between leaders and followers in the ability to innovate, and I agree with that. Adm. Stavridis: First is through education, both formal (post-graduate degrees, executive education, language studies) and informal through self-study via an aggressive program of reading and learning. Second is being open to learning from other leaders and seeking out mentors. A third key is being willing to take risk and try innovative technologies, leadership approaches, and operational concepts. Adm. Stavridis: You have to begin by picking the right teammates, and be very conscious of their ability to work together. Then the keys become having and articulating a clear vision; but at the same time being open to input from the lowest levels of the team. In practice this means listening consciously and then demonstrating to the team that their input is being taken seriously. Obviously, you cannot simply take everyone’s advice –the role of the leader is to rationalize the inputs, reshape them into a coherent vision, and achieve buy-in. It is hard work, and I’ve failed more often than I’ve succeeded; but when you build a good team, shape a vision together, and move out to execute, the results can be magic. Adm. Stavridis: My father, a retired US Marine Colonel, inspired me to remain optimistic in the face of setbacks. He also instilled a love of physical fitness, an important advantage for leaders – it provides additional energy and a boost when needed in difficult situations. General Colin Powell, a mentor for two decades, has provided me a vision of good leadership with his good humor, vision, and simple articulation of leadership skills. Lastly, I admire the current Chancellor of Germany, Angela Merkel. I got to know her when I was Supreme Allied Commander of NATO. She has political skill, determinations, and a rock-solid set of deeply held personal values. Those have led her to make decisions – like accepting hundreds of thousands of refugees – that are not always popular, but were the right thing to do. Adam: What do you believe are three most important issues facing the country and the world? Are you optimistic about our ability to address them? Adm. Stavridis: At the top of my list is the growing gridlock among our national leaders. Our political parties seem to reflect a highly polarized nation, and over time that will be corrosive for our democracy. Tied to that is an increasing strain of nationalism and authoritarianism in a variety of countries around the globe. So just as the US is polarized and weakened, we see other leaders taking advantage – Vladimir Putin at the top of that list. Finally I am deeply concerned about the health of the planet, including global warming, drought, rising sea levels, melting ice caps, and increasing levels of violent storms. That is a dangerous list, but I remain cautiously optimistic about facing these challenges, because some things are going right: improvements in tech and agriculture; the rise of women both in the work force and in leadership roles; the emergence of a massive democracy in India; and a deeper understanding of these problems as we collectively study them. All of this, of course, will require strong, centrist leaders willing to work with others – even those with whom they disagree – to solve problems. Adam: What is the biggest misconception people have about the military, the Navy and military leaders? Adm. Stavridis: If you’ve ever seen the movie, “A Few Good Men,” you will recognize the ultimate stereotype in the form of Jack Nicholson’s Colonel of Marines at Guantanamo Bay. He is smug, overbearing, domineering, prone to fits of extreme anger and outburst, and focused entirely on mission at the expense of his people. Nothing could be further from the truth. The vast majority of leaders in the military are calm, focused, and know how to keep an appropriate balance between mission and taking care of their people. Adm. Stavridis: My father told me in high school to work on the school newspaper and study journalism. It was terrific, practical advice – I learned how to type very fast; be truly curious about the world; tell stories and report facts; prioritize issues; look at everything from two sides; tell a balanced story about controversial issues; and above all to write simply and clearly. That has been helpful every day of my life. Adm. Stavridis: Everyone should try and provide mentorship to the talented and ambitious young people coming along. We have more youth on the planet than ever before in history, and they will shape events dramatically. Mentoring them, as we ourselves were mentored, is the best way to pay forward. Adam: If you could have any job right now, what would it be and why? 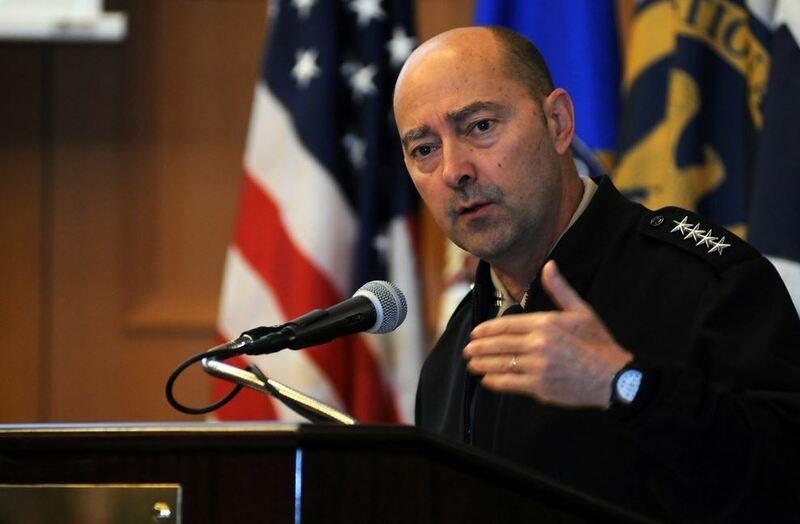 Adm. Stavridis: I’ve had three acts in my life, and I’ve enjoyed them all immensely – a long career in the Navy and at NATO, so military / security; five years as a Dean of a premier graduate school of international relations, The Fletcher School of Law and Diplomacy at Tufts University, so diplomacy / higher education; and international finance as an operating executive of one of the largest private equity firms in the world, The Carlyle Group, so business. To cap it off, I’d love to be the CEO of a big multi-national company focused on some aspect of environmental work – anything from removing plastics from the oceans to addressing drought in sub-Saharan Africa to building sustainable and renewable products for solar power. Adm. Stavridis: Top of the list is collecting antiquarian maps. I have around 200 maps and charts stretching back 450 years. I love the idea of seeing how geopolitics and exploration shaped the modern world. Second is collecting books – I own about 5,000. My wife calls it a “gentle madness” but I often go back and reread a book, and I have a small collection of rare first editions including works by Kipling, Conrad, Hemingway, Margaret Atwood, and Isabelle Allende, among others. I read two or three books a week, often on Kindle because of travel. Finally, I love racket sports – tennis, squash, and racket ball. I played varsity tennis and squash for the US Naval Academy, and rarely go through a week without a racket of some kind in my hand.